Don Tate | Greene County News An EF-1 tornado hit the farm belonging to Julie and Randy Rife on Clifton Road in Miami Township leaving destruction in its wake. 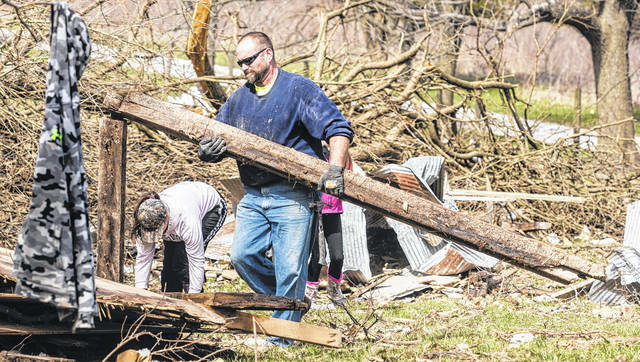 MIAMI TOWNSHIP — What took minutes to destroy will take weeks to clean up and months to rebuild. 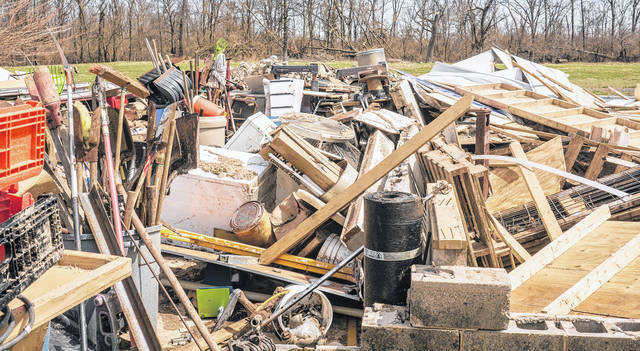 That destruction occurred in the late afternoon April 3 when an EF-1 tornado hit the farm belonging to Julie and Randy Rife — and several other properties — on Clifton Road in Miami Township. Grady Page was helping Randy Rife feed his Shropshire sheep when Page’s father called and warned them to take cover. The two men and one of Rife’s three Great Pyrenees sheep guard dogs headed to the basement for protection. Julie Rife had gone to Springfield to run some errands and missed the initial excitement. 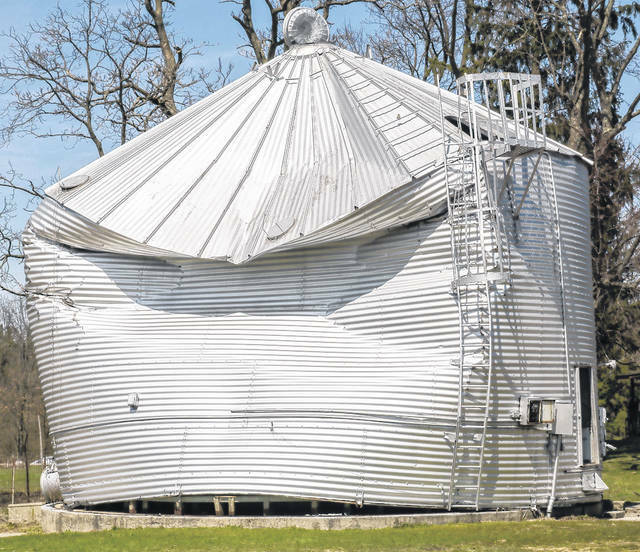 As everyone emerged from their shelter they found widespread damage to grain bins, several barns and many trees. Especially noticeable were the shards of wood framing and the metal siding and roofing widely scattered throughout the sprawling barnyards and nearby pastures. The good news was that the house was intact with only minor damage, although the power was not restored for a couple of days. Generally, the sheep appeared to be safe, but disoriented and wondering around the barnyard. After a final accounting, three ewes and a lamb had been killed and one Great Pyrenees was missing, but the next day it showed up unscathed. Nearly 25 friends and neighbors showed up that first night to help herd sheep to safety and secured enclosures. Many friends have volunteered to help the Rifes clean up. Volunteers also sorted through a large number of stored items currently found on an open concrete slab to see what can be salvaged; items that used to be protected by walls and a roof that no longer exist. Members of the Xenia FFA brought food one day to serve the workers, and some stayed to help with debris cleanup. They had already delivered food to at least two other properties where similar cleanup crews were working. 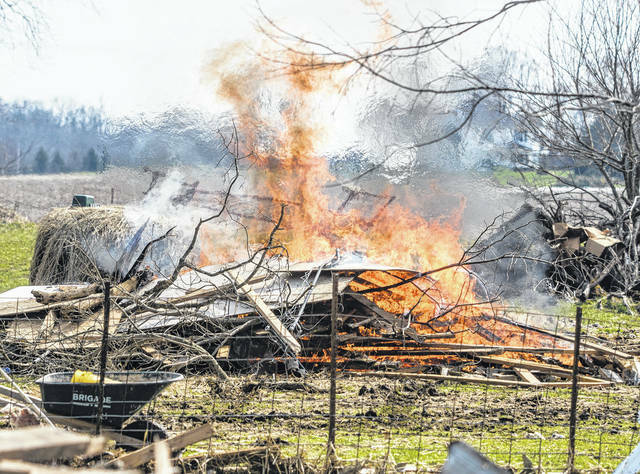 https://www.fairborndailyherald.com/wp-content/uploads/sites/50/2018/04/web1_Tornado-follow-1.jpgDon Tate | Greene County News An EF-1 tornado hit the farm belonging to Julie and Randy Rife on Clifton Road in Miami Township leaving destruction in its wake. https://www.fairborndailyherald.com/wp-content/uploads/sites/50/2018/04/web1_Tornado-follow-2.jpgDon Tate | Greene County News An EF-1 tornado hit the farm belonging to Julie and Randy Rife on Clifton Road in Miami Township leaving destruction in its wake. https://www.fairborndailyherald.com/wp-content/uploads/sites/50/2018/04/web1_Tornado-follow-3.jpgDon Tate | Greene County News An EF-1 tornado hit the farm belonging to Julie and Randy Rife on Clifton Road in Miami Township leaving destruction in its wake. 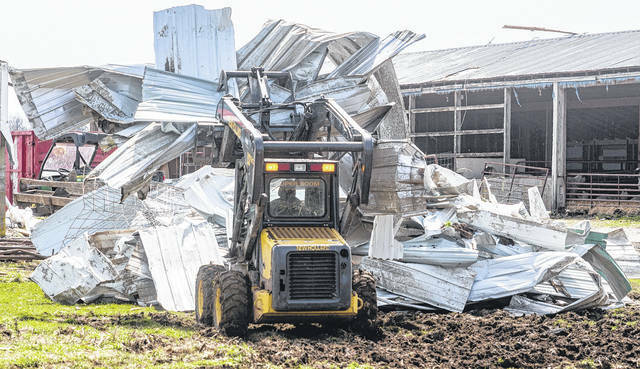 https://www.fairborndailyherald.com/wp-content/uploads/sites/50/2018/04/web1_Tornado-follow-5.jpgDon Tate | Greene County News An EF-1 tornado hit the farm belonging to Julie and Randy Rife on Clifton Road in Miami Township leaving destruction in its wake. https://www.fairborndailyherald.com/wp-content/uploads/sites/50/2018/04/web1_Tornado-follow-6.jpgDon Tate | Greene County News An EF-1 tornado hit the farm belonging to Julie and Randy Rife on Clifton Road in Miami Township leaving destruction in its wake.